People may think Madison is all about that party life when the night starts to fall. Getting drunk and having fun with friends. Not necessarily. Madison is a lot more than that. Personally, a night out for myself would be at the Terrace. Especially when you get there before sun down. The sunset over there is beautiful, not to mention the lake is right there to make it more exotic. Food and ice cream is available to you with the accommodation of events on stage such as; music, comedy, and movies. You might look at that and think it’s boring, seeming it’s more for a family to go to than a bunch of college students. WRONG! As a freshmen, you have plenty of time before wanting to go into bars and get drunk with friends. 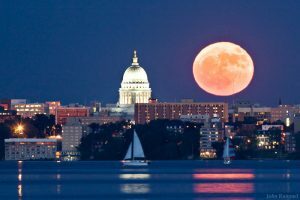 For right now, it’s just about enjoying the scenery and sites of Madison. If the Terrace isn’t catching your eye, then take a stroll down the eventful State Street. Not too far from the Terrace, it is a lighted up street that has somewhat of a romantic feel to it. Take your honey or hubby on a lovely walk up to the Capitol. Along the way you want to buy or grab a bite to eat, there are conveniently placed stores and restaurants. Once you have been fed or can’t buy anymore, you reach the Capitol and notice the moonlight makes this historic building more magnificent to the eye. Not to mention more romantic for you and partner.